She was given a terminal diagnosis at the start of this year and Phelan said the drug Pembro is allowing her to live with the disease. 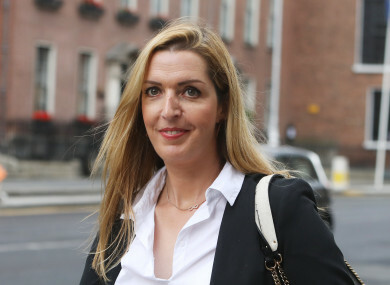 VICKY PHELAN HAS urged the government to make the drug pembrolizumab available to all women with cervical cancer in Ireland. The drug, which Phelan said is allowing her to live with the disease despite her terminal diagnosis in January, has been offered by the State to the 221 women affected by the CervicalCheck crisis. She said Pembro should be made available to all women who are diagnosed with cervical cancer and whose tumours are likely to respond to the treatment. One dose every three weeks costs €8,500 and it is recommended that patients stay on this dose for two years. “That’s a lot of money when you add it up,” she told RTÉ’s Claire Byrne Live last night. Phelan said she feels uncomfortable receiving the drug knowing other women who could be helped by it do not have the option. The 44-year-old said that she has practically no side-effects from the drug and it has given her a much better quality of life compared to her time undergoing chemotherapy when she said she was unable to be there for her children because it made her so ill. Most days I don’t even think about having cancer, to be honest, that’s massive to be able to say that with a terminal diagnosis. For me, it’s a no-brainer if you can target this drug and you score high and your tumour will respond to it, you can live with this disease. Phelan said she recognises that this drug is not a cure for cervical cancer and there may come a time when it stops working, but for now it is buying her time with her family. The HSE said the use of pembrolizumab in the treatment of cervical cancer has been approved by the FDA in the USA, but does not yet have a licence in Europe. “We expect that pembrolizumab will be submitted to the European Medicines Agency for licensing for the treatment of cervical cancer in the future. The HSE said the establishment of the CervicalCheck support package was an “exceptional measure”. During Leaders Questions today, Labour leader Brendan Howlin said that the decision to provide some cancer patients with the drug and not others was made on “dubious legal grounds”. You can’t look two women in the eye suffering from the same disease and say the State will give a potentially life saving drug to one but not to the other. Email “'It's a no-brainer': Vicky Phelan calls for drug to be available to all Irish women with cervical cancer ”. Feedback on “'It's a no-brainer': Vicky Phelan calls for drug to be available to all Irish women with cervical cancer ”.